Why radial wall thickness distribution? Optimal wall thickness distribution in a product not only saves material, cycle time, and energy during manufacture, but also ensures the product’s quality. If the wall thickness is not reached, the product is generally faulty and therefore must be discarded. If the wall thickness is exceeded, on the other hand, it creates unnecessary costs. Increased, irregularly distributed wall thickness also affects cooling time negatively, reducing the achievable production quantity per hour. On the basis of our experience of almost 40 years, we offer our customers products that can be adapted to any application. An optimal combination can be achieved from the twelve PWDS® versions and eleven SFDR® variants that have been patented worldwide. Today, PWDS®/SFDR® systems are available for the manufacture of hollow blow-moulded bodies of all difficulty classes in a diameter range of 50 to 675 mm. Our products are continuously refined: so that we can offer our customers a concept that can always be adapted to changing market requirements. 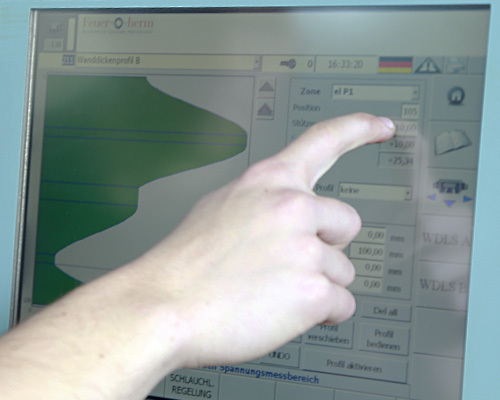 The radial wall thickness system, the Partial Wall Thickness Distribution System (PWDS®) allows the dynamic influence of the radial die gap along the parison length in accordance with prescribed programme curves. The heart of the PWDS® system is the dynamic flexible die ring (DFDR), which is moved with servo hydraulic or electrical actuators. 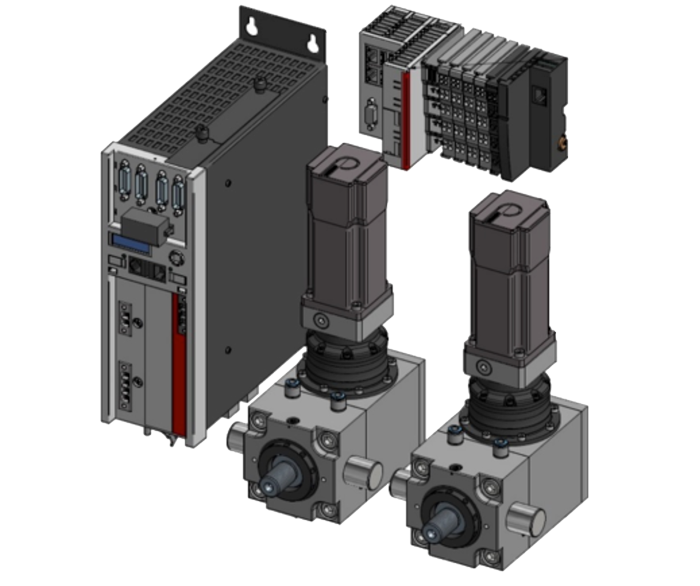 Each PWDS® actuator is connected to the machine control in its own monitoring loop. This makes it possible to control each actuator according to the requirements of the different wall thickness profiles and independently of other actuators. 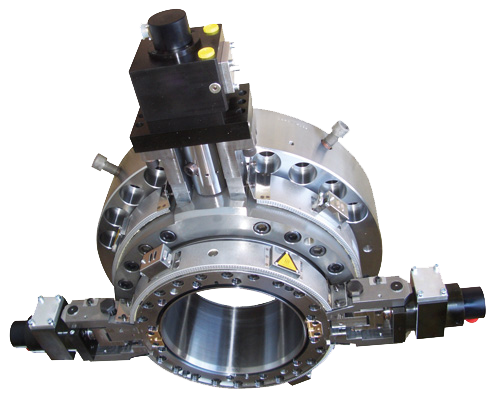 This allows the adjustment of symmetrical and asymmetrical deformations of the die ring and its displacement and any combination of these movements that influence the die gap. 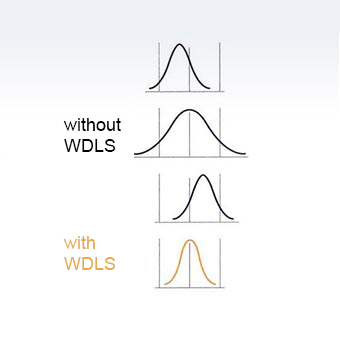 PWDS® works synchronously with the axial wall-thickness-control (AWDS). It has also been possible for several years to equip any PWDS® system with electrical drives. Consistent refinement of the PWDS® system has made a wide variety of designs available today. The original PWDS® variants, D1/D3/D5/D7, which were susceptible to wear and therefore required a great deal of maintenance, have been replaced by wear-free versions with improved performance due to this refinement. Electrival drives are available for all PWDS®-sizes from Ø 50 mm - Ø 675 mm. PWDS® D2 is the standard PWDS® system for symmetrical products. 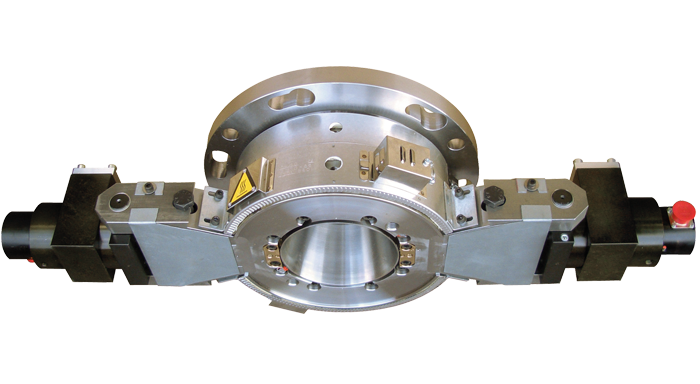 The cylinder axis can be installed in the parting line or at right angles to it. Depending on the design desired, the PWDS® D2 system is constructed in a pushing or a pulling design in order to distribute and reduce the excess material that is located at the parting line. The PWDS® D2 couples the programme curves for the two PWDS® cylinders and runs them over one wall thickness profile curve. This symmetrical method makes PWDS® D2 especially suited to the production of canisters and barrels. PWDS® D6 is the standard PWDS® system for asymmetrical products. This design sets two independently operating wall thickness profile curves for the PWDS® cylinders. 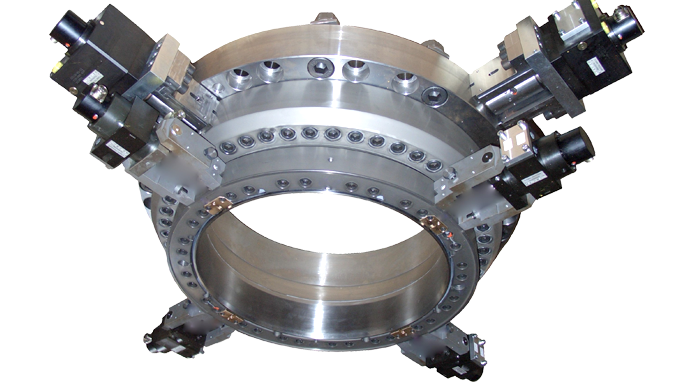 This allows not only symmetrical pulling and pushing of the flexible die ring, but also displacement and any combination of these movements. 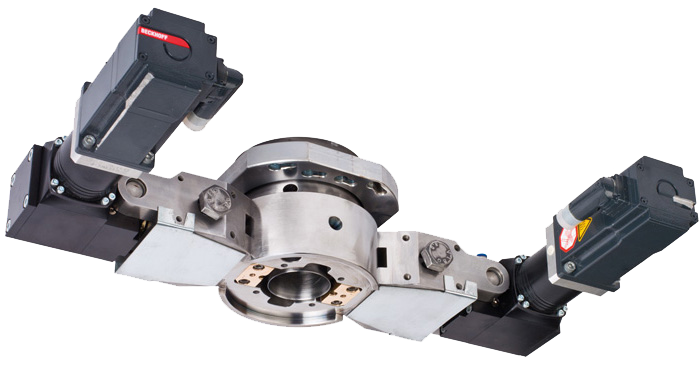 The PWDS® D6 allows the cylinder axis to be installed in any position. This has the additional advantage of allowing it to be adapted to the special requirements of the product at hand. These many options make the PWDS® D6 an optimal solution for products which are not symmetrical to their parting line. It is therefore the optimal die system for the production of plastic fuel tanks and for various special applications. The PWDS® D11 is a refinement of the PWDS® D6 especially for use with small products and thus the smallest PWDS® diameters. In order to service the challenging market of products with volumes of less than three litres, we developed the new PWDS® D11. Just like the PWDS® D6, it has the highest possible flexibility and is eminently suitable for the production of bottles with handles, for instance. The PWDS® with an additional shifting axis, also known as the PWDS® with a third cylinder, has proven itself for many applications. The third cylinder can be set to nearly any position in relation to the other two. This system is thus particularly well suited to the manufacture of plastic fuel tanks (especially saddle tanks), and other products for which smaller die diameters are used. The PWDS® with remote controlled die centring replaces manual adjustment of the parison and allows adjustment of the parison while production is in progress. The SFDR® (Static Flexible Deformable Ring) unit replaces the solid mandrel: This flexible adjustable unit allows profile modifications that can be reproduced at any time and do not require de-installation of the mandrel tool. This has two advantages: During mould validation for the article, the profiling can be changed as often as is necessary. This is not possible with a profiling that has been mechanically incorporated. The second advantage is the adaptation to changes in production. Corrections based on materials that are used in different ways or a profiling for a completely different article can be implemented quickly and easily. This allows modification times to be optimized, which is especially important for standard blow-moulded articles, since they are often manufactured with the same containers but different weights and materials or different hollow bodies with the same diameter. Market requirements and practical experience have led to systematic refinements in the SFDR® mechanism as well. The SFDR® S2 is the original standard SFDR design. 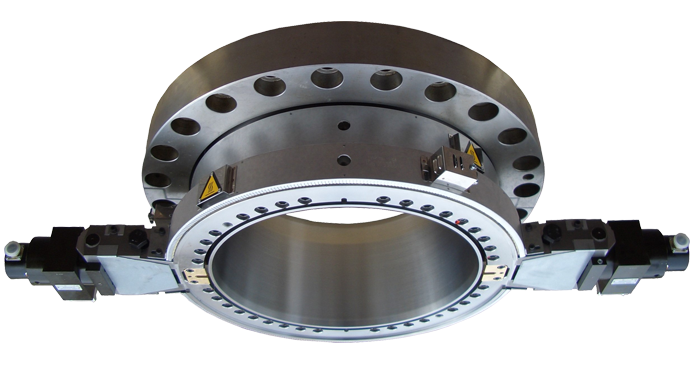 It consists of three components: one mandrel shaft, one mandrel interior part, and one SFDR® ring. Adjusting the setting screws in the mandrel interior elastically deforms the SFDR® ring. This allows any desired profile to be set and modified and adapted at any time. The result is unprecedented flexibility. Even today, solid mandrels are profiled mechanically. However, profiling that is too deep cannot be reversed and may even result in the entire mandrel becoming unusable. In addition, a solid mandrel that has once been profiled cannot be used for a different product. But the SFDR® can, at any time. The SFDR® S2 is rarely used any more. It has largely been replaced by the refined S4 version. The SFDR® S4 consists of four components: a mandrel shaft, an intermediate mandrel part, an SFDR® ring, and the most important component, the changeable insert. 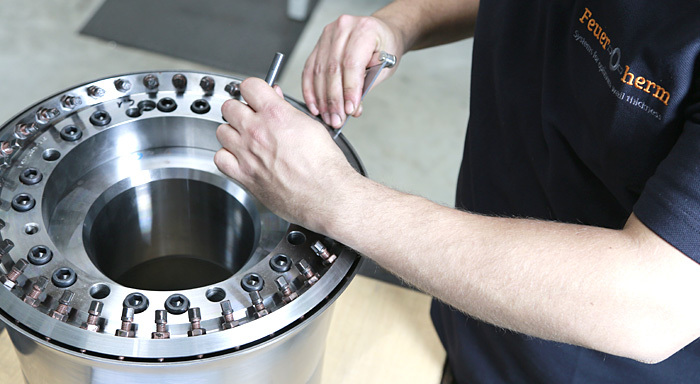 Depending on requirements, the inserts can be replaced without the necessity of de-installing the mandrel tool. Example: The mould for an article with various weights is being validated. Various weights also mean various profiles in the mandrel and thus various SFDR® settings. If a separate insert is to be validated for each weight, only the insert, which has once been optimized for a specific weight, need be changed when production switches to a different weight. This provides great advantages for modification time optimization. There is no need to replace the entire mandrel tool, and a profiling that has once been optimized need not be changed if the inserts are used. Today, about 90% of SFDR® units are S4 versions. 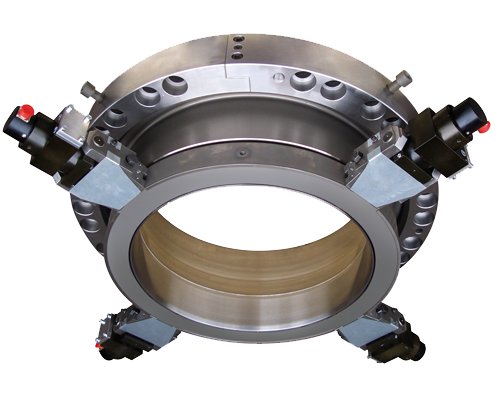 The WDLS (Wall Thickness Position Control) that we have developed ensures that the condition that has once been optimized can be maintained permanently and the wall thickness distribution and net weight of the blown part can be held constant at the lower weight limit.